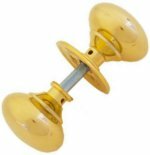 Rim knobs are for use with traditional rim locks and rim latches. Solid brass Victorian rim knob set for use with rim sash locks. 52mm diameter knob on 56mm back rose. Compatible with brass rim locks on 'door locks' page. Solid brass Queen Anne rim knob set. 52mm diameter door knob on 59mm back rose. Compatible with traditional rim locks on 'door locks' page. Solid brass oval rim knob set for use with rim sash locks by Fulton & Bray. Size 60mm x 36mm oval diameter knob on 62mm back rose, projection 75mm. Heavy weight unsprung brass foundry rim door knobs by Fulton & Bray. Size 58mm diameter knob on a 62mm diameter back rose, 60mm projection. Supplied as set with follower bar and fixings. Available in Polished Brass, Satin Chrome & Polished Chrome. Heavy weight unsprung brass foundry ball rim door knobs by Fulton & Bray. Size 50mm diameter knob, 62mm diameter back rose, 82mm projection. Supplied as set with follower bar and fixings. Beehive reeded rim door knobs, 55mm diameter knob, 59mm back rose, sprung on one side, 89mm projection. Supplied in pairs with follower bar and fixings. Heritage Brass Victoria rim door knobs. Size 55mm diameter knob on a 57mm diameter single back rose. Solid brass door knobs in the Victorian period style, supplied as a set with follower bar and fixings. Antique brass Victoria rim door knobs. Size 55mm diameter knob on a 57mm diameter single back rose. Solid brass door knobs in the Victorian period style, supplied as a set with follower bar and fixings. Satin brass Victoria rim door knobs. Size 55mm diameter knob on a 57mm diameter single back rose. Solid brass door knobs in the Victorian period style, supplied as a set with follower bar and fixings. Matt bronze Victoria rim door knobs. Size 55mm diameter knob on a 57mm diameter single back rose. Solid brass door knobs in the Victorian period style, supplied as a set with follower bar and fixings. Suffolk rim door knobs, on a 57mm diameter back rose, supplied in pairs with follower bar and fixings. Fulton & Bray Victorian brass mushroom rim door knobs. Size 51mm diameter knob on a 60mm diameter back rose, 65mm projection. Supplied as set with follower bar and fixings. Unlacquered brass rim knobs which can be polished or left to age gracefully over time developing it's own unique patina. Available in a knob diameter 49mm, on a 51mm unsprung back rose, 49mm projection, or knob diameter 57mm, on a 57mm unsprung back rose, 55mm projection. Supplied with two loose roses and spindles so can also be used as a mortice door knob. Dark ebonised wooden rim knob set with detachable solid brass roses for use with rim locks or as a mortice door knob set. 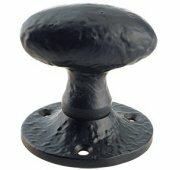 54mm diameter ebony finish knob, 67mm projection, 57mm back rose diameter. Dark veined rosewood finish ringed wooden rim knob set with detachable solid brass back roses for use with rim locks or as a mortice door knob set. 54mm diameter rosewood finish knob, 70mm projection, 67mm back rose diameter. 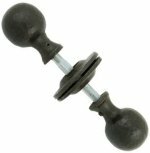 Ludlow Foundries black iron antique finish ball rim door knobs. 45mm knob diameter on 60mm back rose, 67mm projection. 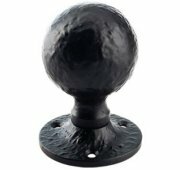 Black iron ball rim knobs. Size 42.5mm diameter round knob on a 55mm back rose, 62mm projection. Black iron oval rim knobs. Size 68mm diameter oval knob on a 60mm back rose, 62mm projection.